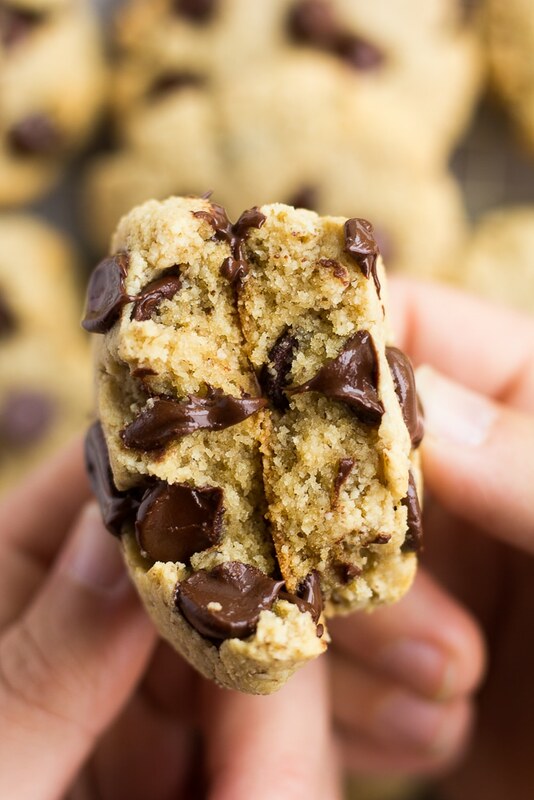 These Vegan Gluten Free Chocolate Chip Cookies are lower in sugar than most, high in protein, and ultra delicious! Simple to make in just 1 bowl, 8 everyday ingredients and 20 minutes. 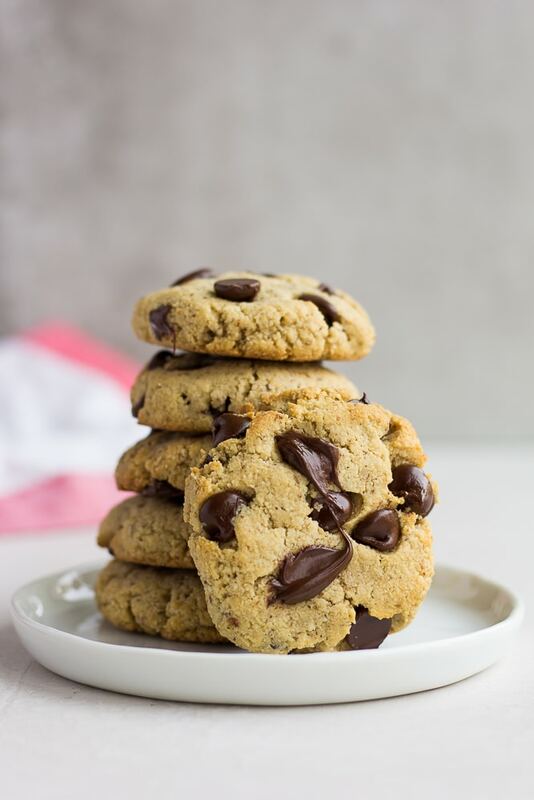 Meet my other favorite chocolate chip cookie (SEE Perfect Vegan Chocolate Chip Cookies), except these babies are gluten free and quite a bit healthier. But don’t worry, “healthy” does not equal poor taste here! These cookies are chewy, nutty, and SO easy to make. Oh! 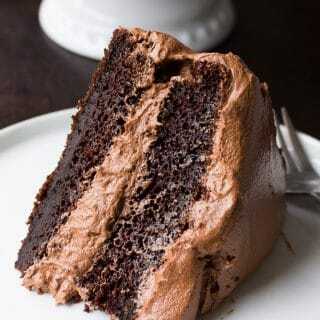 And full of chocolatey melty goodness. I love these cookies for my kids because they are lower in sugar than most and are packed with nutrition thanks to almond flour. My twins play a lot of sports, and they rely on quick nutritious food they can grab while heading out the door, or after practice. Cookies like these are PERFECT, because they love them and I can feel good about the nutrition they’re getting to fuel their many activities! Win, win. 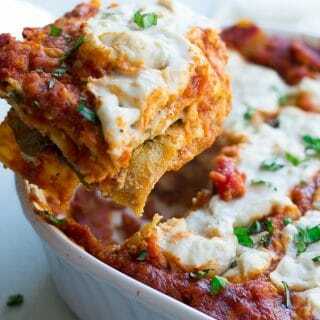 This recipe is also great because it only calls for 8 ingredients and you can use 1 bowl! Talk about simple. 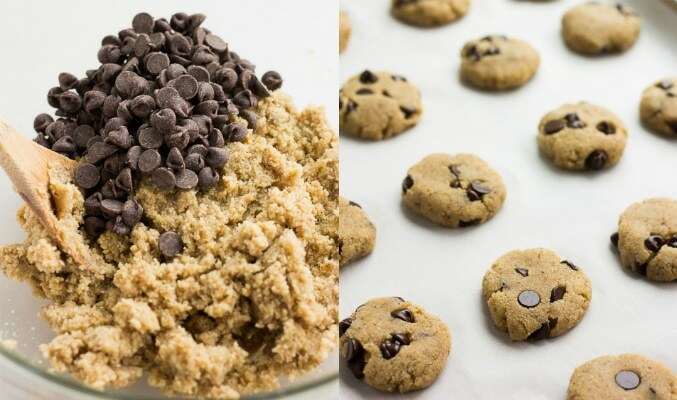 You will be eating delicious cookies in 20 minutes. 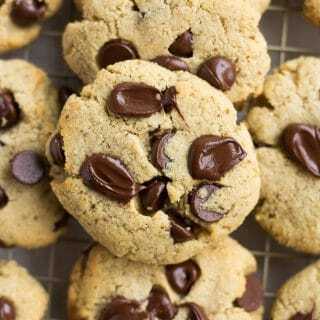 How do you make Vegan Gluten Free Chocolate Chip Cookies? Preheat the oven to 350 degrees and line a baking sheet with parchment paper. In a small bowl, combine 1 tablespoon flax with 2.5 tablespoons water and set aside to thicken. Meanwhile, cream together the brown sugar and coconut oil (only 2 tablespoons) with a wooden spoon in a large bowl. Now add the baking soda, salt, vanilla and the flax egg and mix well, for a few minutes until smooth. 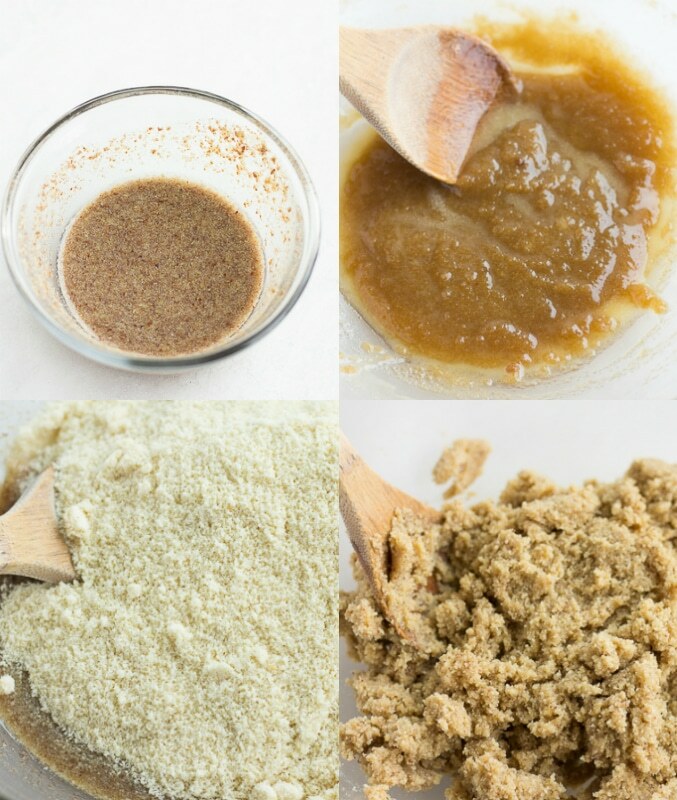 Dump in the almond flour and mix until combined into a thick dough. Fold in the chocolate chips, using your hands if necessary! Scoop the dough by heaping tablespoons and roll into about 12 balls. Place on the prepared baking sheet and flatten each ball slightly with your hands (they won’t spread too much in the oven). Bake for 10-12 minutes, and then let them cool for about 10 minutes before moving to a cooling rack. They will firm up as they cool. Where can I find almond flour? 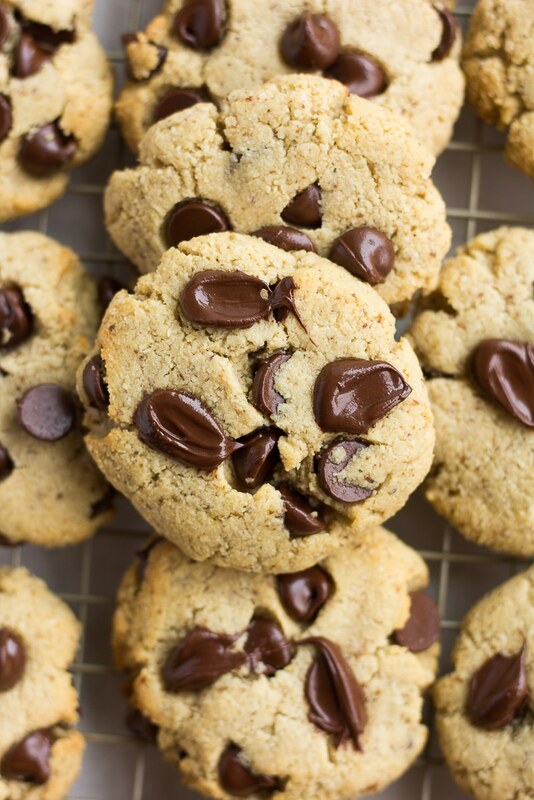 Almond flour does wonderful things for baked goods, especially gluten free recipes. 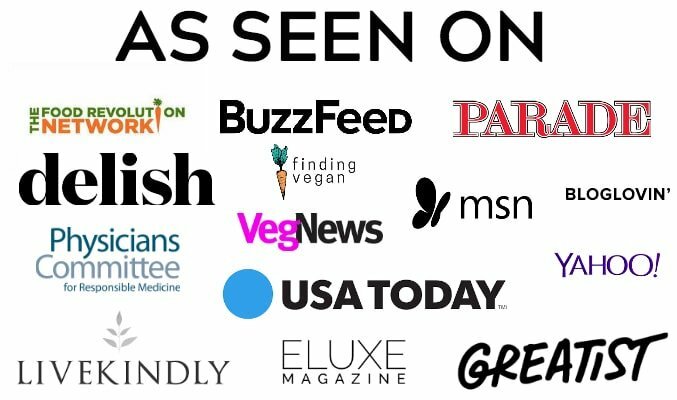 You can find it on Amazon, and many stores carry it as well. I’ve even found it at Costco for a great price! Trader Joe’s carries it in my area, and my discount store usually has it in bulk. Look around for the best price, because some stores charge a ridiculous price for it! 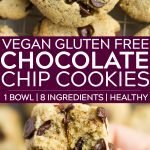 How should I store Vegan Gluten Free Chocolate Chip Cookies? 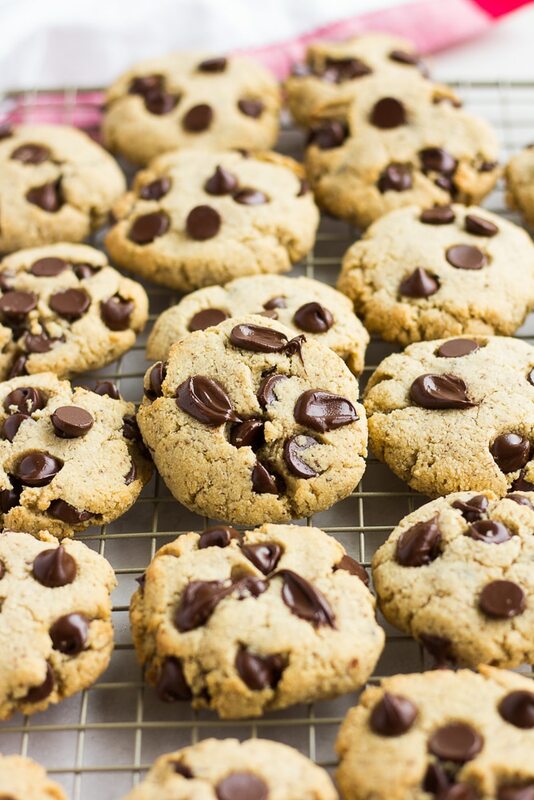 Keep leftover cookies in a covered container at room temperature for 3-4 days, or a week in the refrigerator. 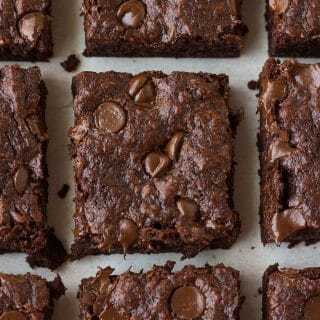 They are perfect for freezing, so make a double batch and have cookies ready whenever a craving strikes! I freeze cookies in a large ziplock freezer bag or a covered freezer safe container. Make the flax egg: In a small bowl, combine 1 tablespoon ground flax with 2.5 tablespoons warm water. Let sit for a few minutes. Cream together brown sugar and coconut oil with a wooden spoon in a large bowl. Add baking soda, salt, vanilla and the flax egg. Mix well. Add the almond flour to the bowl and mix until combined. Scoop the dough by heaping tablespoons and roll into about 12 balls. Place onto prepared baking sheet and flatten slightly with your hand. Bake for 10-12 minutes. Let cool for at least 10 minutes before moving to cooling rack or eating. They will firm up a bit as they sit. Store in a covered container for 3-4 days at room temperature, or longer in the refrigerator. Recipe makes about 12 cookies. *This post was updated on February 13th, 2019 with new photos. Thank you!